What do you do when you're stuck in the house all day cleaning because it's raining outside? Well...you slow roast Roma tomatoes in the oven to make a tomato jam for a caprese sandwich and roasted tomato-basil soup. My house smelled of garlic, thyme, rosemary and basil all day today. It sure makes cleaning a whole lot easier. Unfortunately, I still need to do the dishes, but thankfully soup and sandwiches are an easy clean-up! 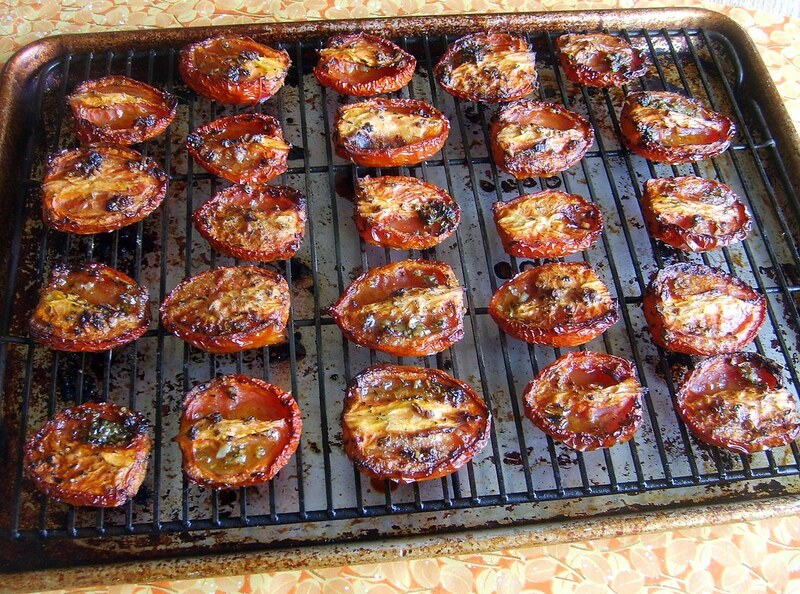 Toss tomatoes with herbs, olive oil, salt and pepper and place on a rack on top of a sheet pan to catch drippings. Slow roast tomatoes for four hours, turning tray every hour. Let tomatoes cool and remove skin. In a sauce pan, heat olive oil and cook onions, celery and carrots until soft, about five minutes. Add garlic and cook two minutes longer, stirring to prevent burning. Add tomato paste and red wine and cook until wine has evaporated, about two minutes. Add roasted tomatoes, diced tomatoes, water, thyme and bay leaf. Bring to a boil and reduce to a simmer and cook for about 40 minutes. Adding more water if necessary. Add tomato mixture to a blender in batches and blend until smooth, adding salt and pepper to taste. Strain soup through a mesh strainer to remove any skins or seeds and return soup to the pan and place heat on low to keep warm. Check seasonings and just before serving stir in fresh basil. Place all ingredients in a bowl and stir to combine. Let sit at room temperature until ready to use. Brush the outside of each bread slice with olive oil, turn over and sprinkle with mozzarella and cheddar cheese. Next spoon on tomato jam, add basil leaves, and more mozzarella cheese. Close sandwich and grill on panini press for 2-3 minutes until golden brown and cheese has melted. 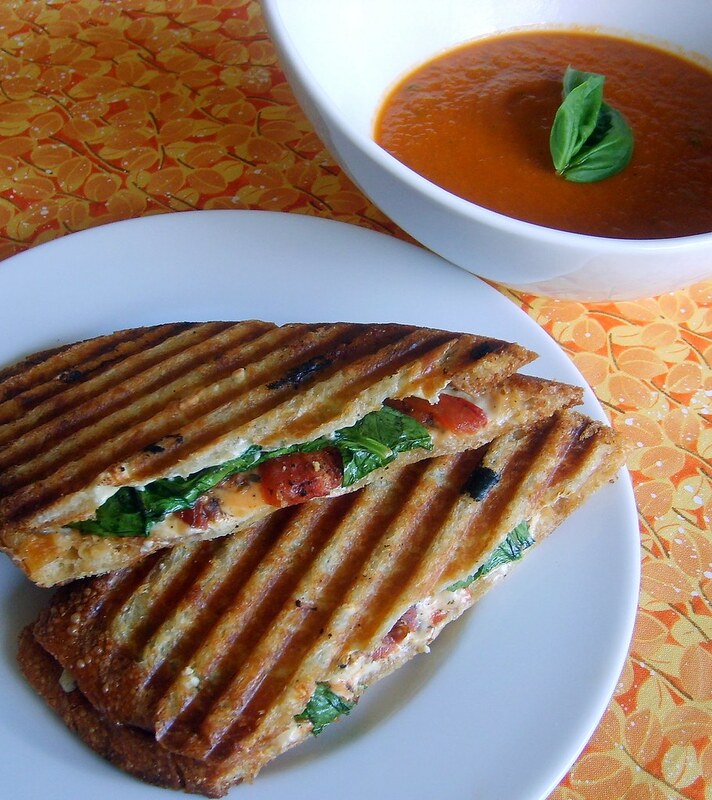 Slice on a bias and serve with a bowl of roasted tomato-basil soup.